On December 7, the day that the Student/School Performance and Support Committee (SSPS) of the Louisiana Board of Elementary and Secondary Education (BESE) voted to approve new biology textbooks, Zachary Kopplin's letter to the Shreveport Times was published: "La. students need proper scientific textbooks without creationism." Zack is a senior at Baton Rouge Magnet High School who assisted the Louisiana Coalition for Science in making the case to the SSPS Committee for approving the textbooks. (He also testified at the November 12, 2010, meeting of the Textbook/Media/Library Advisory Council.) 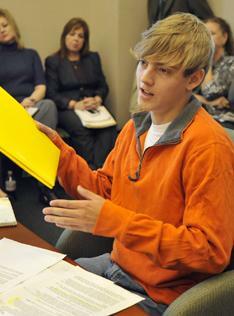 As his senior project at school, he has chosen to mount an effort to have the Louisiana Science Education Act repealed. Readers of this website will be hearing much more about this effort in the near future. Go to Zack's website and see if you can help.